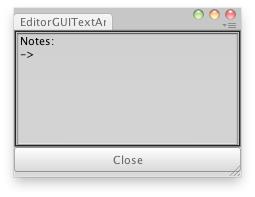 This works just like GUI.TextArea, but correctly responds to select all, copy, paste etc. in the editor. Text Area in an Editor Window. // This doesnt preserve the notes between sessions. // check EditorPrefs Get/SetString to save the notes.